I'm supposed to be flying over the Atlantic right now to attend the OpenStack Summit, but British Airways had other plans for me: I'm stuck in London for a few hours, and will head towards New York tonight, before going to the west coast. 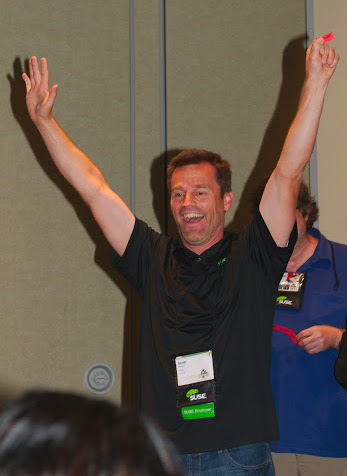 But since I have Internet access, I guess it's a good opportunity to write about something that happened last month: I joined the openSUSE Board as chairman! 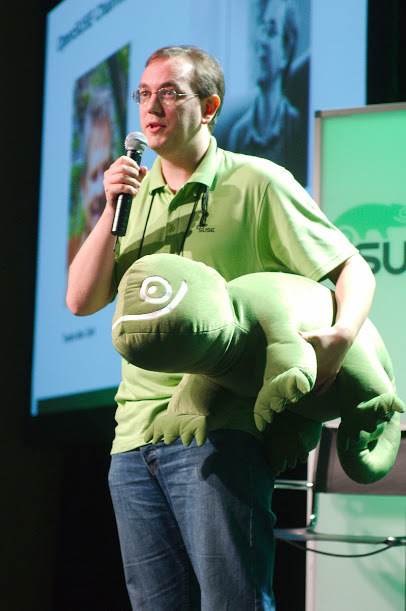 For those who don't know about the governance structure of openSUSE, the openSUSE Board is a group of six people that exists to serve and guide the community. This includes working on legal and financial topics, talking to our different sponsors, etc., but it specifically does not deal with the technical side of the project. The Board is made of six members: five who are elected by the community, and one (the chairman) who is appointed by SUSE. Until recently, Alan Clark was the chairman, but he recently got elected chairman of the OpenStack Foundation. I was surprised when I got asked if I'd be willing to step up, but that was a pleasant surprise: I was actually considering running for the next board elections, so it didn't take me too much thinking to accept :-) I got interviewed twice about this new position. This is quite cool, as it shows how much people are interested in what's going on in the openSUSE world. I do believe there's a lot the Board can do to help the project, and there are many ideas I'd like to push, a lot of them coming from my experience at the GNOME Foundation. But the way I (and I hope, many others) see it, the chairman is just one member among others; of course, the chairman should be a bit more proactive in pushing the others, but that's the main difference. It's therefore important to have great people in the Board, like we do today. But guess what, we also have elections coming in a few weeks, so if you feel you can make a difference, consider running! If you don't want to run but have ideas to share, don't hesitate to mail the board or me to send us your input. Because of this new position, I went last month to Orlando, in order to attend SUSEcon and the openSUSE Summit that was organized just after SUSEcon. This was really a last minute decision: I booked my flights three days before leaving... Both were amazing events, especially when you think that this was the first year for both events. It was no surprise, but there was quite some discussion about the cloud during SUSEcon. And actually, I was surprised at how much interest there was from everyone. I was helping on the SUSE Cloud booth, and many people came in — some to just learn about the field in general, while others had some pretty deep questions about the technologies. Everyone was mentioning OpenStack during the keynotes, and the SUSE Cloud product was deployed live during the closing keynote to show how easy it is to deal with. SUSE also produced some fun videos about the cloud. The openSUSE Summit had many people coming (more than I expected! ), and it was a lot of fun. Bryen and the whole team did an amazing job with the organization, and I think everybody enjoyed the family atmosphere that this event had. There were also great sessions (although I only attended two of them), and thanks to ownCloud and Omnibond, we had fun parties in the evenings. I especially loved building the small boats (or a car, like Simona and I did). The openSUSE Summit also hosted a GNOME hackfest on user observation. Anna, Federico and Cosimo wrote about it already. It looked like it was a useful hackfest, from what I could see! 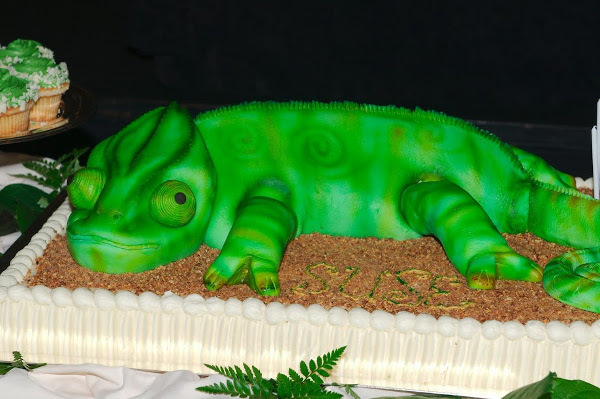 Oh, and I had the opportunity to talk with Sam Varghese during SUSEcon about how GNOME is doing. I hope the resulting article gives a new perspective about the current direction to people outside the GNOME community. The picture with the giant gecko: that is how one addresses an audience. I will repeat the same: "do what's good for the project! " Wonderful to have you around. The summit was so well done. I loved it! Thanks for coming on board to the community.